Near the end of term 1 as we were reviewing for midyear exams, I had this brilliant idea where I could prevent the pandemonium that would break out every time I brought a class up to the computer lab… by not bringing classes up to the computer lab. Rather than holding review sessions in an awkwardly shaped room with a lack of chairs and lecturing on networked computer screens, I could communicate ideas much better by going to the classroom and writing on the chalkboard. In addition to ensuring that everyone had a seat, this also left students in a familiar environment where they’re used to behaving. It was awesome. With that in mind, I’ve adjusted my teaching style to forge more of a lecture and lab style. I teach the concept (e.g. the formatting toolbar, basic excel formulas, etc.) in the classroom on the chalkboard, and then the next class we go up to the computer lab to practice. Rinse. Repeat. While I have no hard evidence of this system’s worth, I feel better at the end of the day, and anecdotal evidence suggests the kids are far less clueless when they actually get on the computer. Rather than spending the entire period walking around undoing the hell out of each group’s Word document, I can make a few changes here and there and move on. And if a group gets stuck, I can refer them to their own notes. And then I can walk away. How freeing. There are a number of drawbacks to this situation. For one, teaching computers in the absence of computers means forcing students to make theoretical leaps that can be difficult to communicate in English, let alone through a language barrier. In this sense, the lecture and lab format benefits the kids with the best English. Lecture is more of a “telling” whereas lab is more of a “showing”. Showing is more universal. This problem is exacerbated as the curriculum becomes more complex. For example, this week I’ve been teaching cut, copy, and paste in the year 9 and 10 classes. While copy and paste are incredibly basic, there are a bunch of nebulous concepts to wrap your brain around. “The computer has an invisible clipboard that can only hold one thing at a time. Copying sends text or objects to this invisible keyboard. Cutting does the same but deletes the original text or object.” It gets a little weird. But I suppose getting everyone to make the nebulous leaps is the essence of teaching. 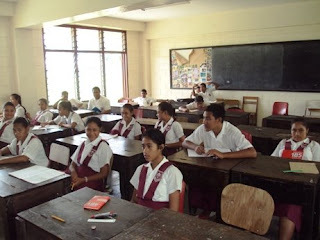 And since, except for Samoan language tests, all exams are held in English, the kids with the poor language skills are going to have to pick it up at some point. Just as well that they copy it down in their notes. One more factor that’s less than ideal: I only see the year 9s and 10s once a week. This means expecting them to connect last Tuesday’s theoretical concepts with practical applications next Tuesday. All I’m saying is if the average “LOST” viewer can do this from week to week, why should I not expect this from my year 9s? Enjoy your weekend. Random pictures from the last 2 weeks below. Phil's friend Taylor, Phil, and Blakey. Big love? 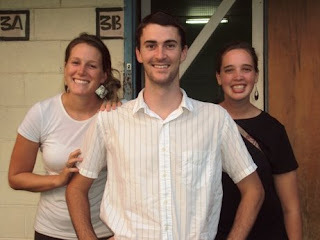 "Angels and Demons" was banned in Samoa. 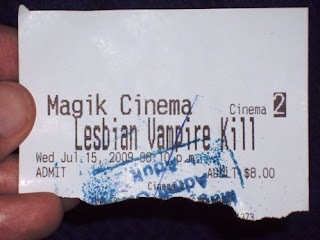 "Lesbian Vampire Killers"? Totally okay. 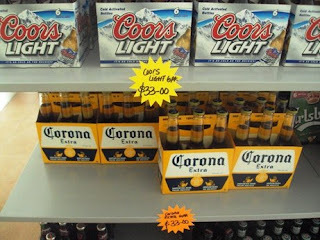 Coors Light and Corona for the same price. 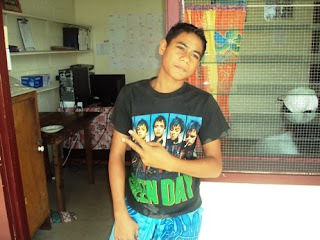 This kid was walking around my school wearing a Green Day T-shirt. So I asked him if I could take his picture. He immediately fell into this pose with the distant misanthropic gaze. Yet his peace sign still says he cares. Quite the model. Great picture of Blakey, Phil and Taylor! I also like the one of the kid in the Green Day shirt. Maybe you should have the kids do some actual cutting and pasting. Do you have paste in Samoa?